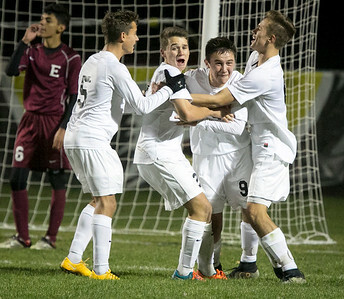 Daryl Quitalig - For Shaw Media Jacobs' Nicholas Voss (9) celebrates a goal with teammates Colin Walsh (5), Gabriel Swarthout (2) and Noah Melick (6) during the IHSA Class 3A Jacobs Regional final game at Jacobs High School on Saturday, Oct. 24, 2015. The Golden Eagles emerged champions, 6-2. 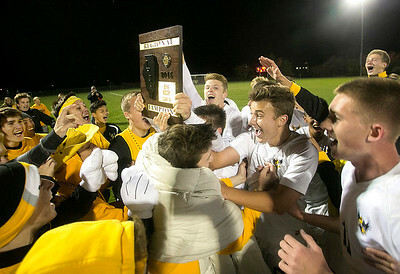 Daryl Quitalig - For Shaw Media Jacobs celebrates their earned IHSA Class 3A Jacobs Regional Champion plaque with fans after the final match at Jacobs High School on Saturday, Oct. 24, 2015. The Golden Eagles won with a final score of 6-2. Daryl Quitalig - For Shaw Media Jacobs' Jacob Moser (13) dribbles the ball during the IHSA Class 3A Jacobs Regional final game at Jacobs High School on Saturday, Oct. 24, 2015. The Golden Eagles emerged champions, 6-2. Daryl Quitalig - For Shaw Media Elgin goalie Edgar Rodriguez sits dejected after losing the IHSA Class 3A Jacobs Regional final to Jacobs High School on Saturday, Oct. 24, 2015. The Golden Eagles emerged champions, 6-2. 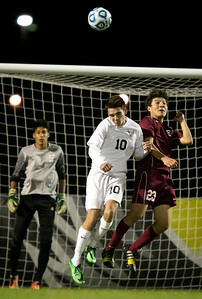 Daryl Quitalig - For Shaw Media Elgin's Alex Kunicki (1) headers the ball, challenged by Jacobs' Konad Wasilewski (11) during the IHSA Class 3A Jacobs Regional final game at Jacobs High School on Saturday, Oct. 24, 2015. The Golden Eagles emerged champions, 6-2. 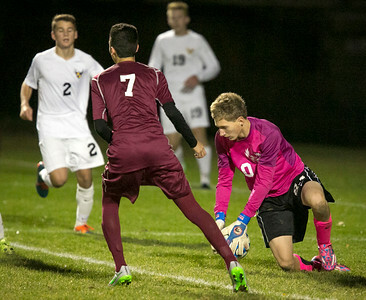 Daryl Quitalig - For Shaw Media Jacobs goalkeeper Ethan Pickering (0) makes a save during the IHSA Class 3A Jacobs Regional final game at Jacobs High School on Saturday, Oct. 24, 2015. The Golden Eagles emerged champions, 6-2. 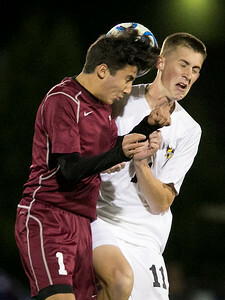 Daryl Quitalig - For Shaw Media Jacobs' Kurtis Preis (10) and Elgin's Manuel Ramirez (23) challenge one another for the ball during the IHSA Class 3A Jacobs Regional final game at Jacobs High School on Saturday, Oct. 24, 2015. The Golden Eagles emerged champions, 6-2. Daryl Quitalig - For Shaw Media Elgin's Jonathan Ramirez (22) dribbles the ball away from Jacobs' Daniel Kim (3) during the IHSA Class 3A Jacobs Regional final game at Jacobs High School on Saturday, Oct. 24, 2015. The Golden Eagles emerged champions, 6-2. Daryl Quitalig - For Shaw Media Elgin's Jesus Lopez (12) dribbles the ball during the IHSA Class 3A Jacobs Regional final game at Jacobs High School on Saturday, Oct. 24, 2015. The Golden Eagles emerged champions, 6-2. Elgin's Jesus Lopez (12) dribbles the ball during the IHSA Class 3A Jacobs Regional final game at Jacobs High School on Saturday, Oct. 24, 2015. The Golden Eagles emerged champions, 6-2.